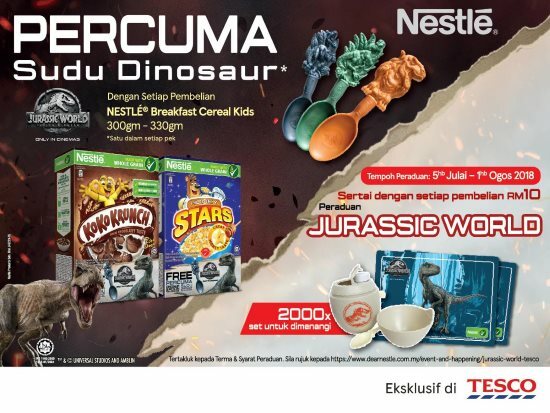 Home » lucky » lucky draw » Nestle » purchase » qna » spend » Tesco » WhatsApp » NESTLÉ BREAKFAST CEREAL Jurassic World Contest @ TESCO: 500 Jurassic World Breakfast Sets to be won! NESTLÉ BREAKFAST CEREAL Jurassic World Contest @ TESCO: 500 Jurassic World Breakfast Sets to be won! Buy a minimum of RM10 worth of any participating NESTLÉ Breakfast Cereals Kids products as shown in the Promotion posters in a single printed tax invoice receipt from any participating TESCO outlets during the Promotion Period. Write your full name, I/C number and the correct answer on the receipt. Take a photo of the receipt and WhatsApp to 013-323 3128. Visit NESTLÉ BREAKFAST CEREAL Jurassic World Contest @ TESCO for more details.